After the Arabs in the 6th and 7th centuries occupied most of the ancient world, they fell heir, in the field of mechanics and engineering; to the early inventions of the Egyptians, Greeks, Indians, Persians and Romans. Between the 8th and 16th centuries, these were incorporated with new creations to produce a flourishing technology in the Muslim world, known thereafter as Arab and/or Islamic mechanics and engineering. Machines designed for irrigation, industrial work and, to a lesser extent, war were improved or invented and became widely diffused in all parts of the Islamic homeland. In addition to these useful devices, the wealth and traffic within the huge empire from China to the heart of France made possible the invention of other types of machines built to cause wonder and aesthetic pleasure to the rulers and the opulent. In the subsequent centuries, these Arab/Islamic mechanical devices, from Arab Spain and Sicily, spread to the remainder of Europe. Yet, in our times, we know little of these Arab/Islamic influences in western technology. Technical historians in the West generally skip the period from the fall of the Roman Empire to the 12th century when Arab mechanics was as its zenith. The prestigious work, Legacy of Islam, which gives an account of those elements in the culture of Europe that are derived from the Islamic world, barely mentions the Arab/Islamic contributions to mechanics. D.R. Hill, who has written much about Arab mechanical technology, in The Genius of Arab Civilization, indicates that of all fields in which the Arabs have made significant contributions to the progress of civilization is that of mechanical technology and that this has been the least studied. Hence, a damaging belief in the past has taken root, both in the West and the Arab countries, that modern technology is solely a western achievement. Only in our times, has some research been made in these largely forgotten contributions. The great interest by the Arabs in all types of machines, especially hydrostatics was stimulated when the 2nd century Pneumatics of Pillo of Byzantium and the 1st century Mechanics, a three volume treatise by the dynamical genius, Hero of Alexander, were translated into Arabic. These were complemented by the introduction of the Hindu numerals and the later invention of algebra and trigonometry that helped immensely in the computations the Arabs were to use in mechanics. In the succeeding centuries; even though the Arabs followed the Greek and Roman traditions in improving and inventing machines and other mechanical devices, their work was made much easier by the new mathematics. The Arabs applied the principles of Hero in improving the Roman watermill and utilized it extensively for irrigation in every part of the Muslim world. Later, it was introduced throughout Moorish Spain into Medieval Europe under the name noria, from the Arabic naurah. However, before the improved watermill, the windmill, an Arab invention, had become known in most parts of the Islamic world. The first one recorded in history was built in the 7th century by the order of the Caliph ‘Umar. A few decades later it had become common in the Middle East, reaching Europe in the early era of Islam. Both the watermill and windmill were great gifts to humanity – crushing sugarcane and olives, grinding grains and pumping water. Nevertheless, these two workhorses of man are only the tip of an iceberg in the Arab contributions to world mechanics. Dr. Ahmad Y. al-Hassan, formerly the president of Aleppo University in Syria, who has written and lectured a great deal about the Arab elements in mechanics, gives us a revealing look into this science. According to this distinguished engineer-historian, three books spanning seven centuries constitute the principle links in the chain of the heritage of Arab/Islamic mechanics and shed light on the achievements of the Arabs in this domain of technology. 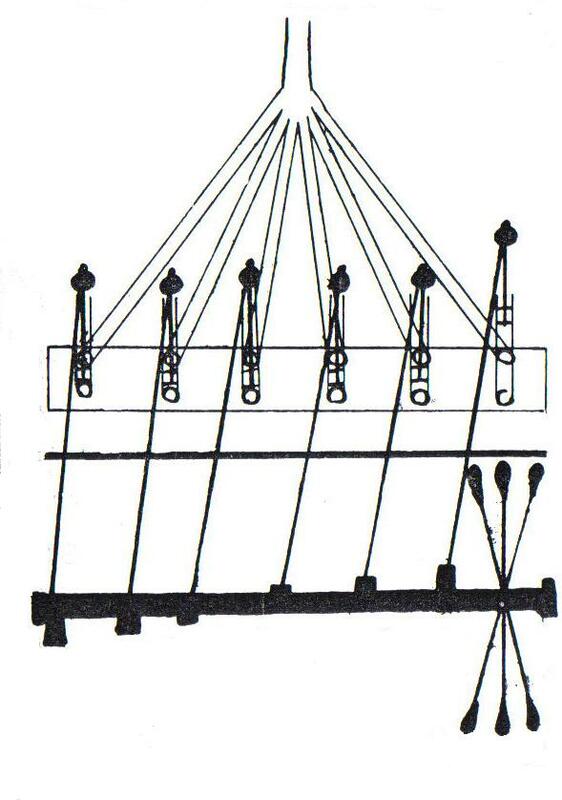 Diagram of a hydropowered perpetual flute from The Book of Knowledge of Ingenious Mechanical Devices by Al-Jazari in 1206. The earliest work is Kitab al-Hiyal (The Book of Ingenious Devices) written in the 9th century by the Banu Musa (sons of Musa ibn Shakir) during the golden age of the Abbasid Empire. Their work revealed originality and far transcended the limits that bound the Greeks and Romans and was unique in relation to all which had been previously written on the subject. The Banu Musa were pioneers in the world of scientific invention and distinguished in all branches of mathematics, astronomy, physics and mechanics. Their work left monuments of lasting value in the description of trick vessels, fountains and other automata. In the history of technology, the sons of Musa were the first to use crankshafts – 500 years before their initial description in Europe. In medieval times, Kitab al-Hiyal was one of the most widely circulated works among mathematicians. It is believed that Copernicus made use of these authors’ ideas – basing his angle trisection on the method they introduced. Perhaps, more important than the work of the Banu Musa is that of the 13th century Badic al-Zaman ibn al-Razaz al-Jazari. One of his books Al-Jami Bayn al-Ilm wa-l Amal al-Nafi fi Sinaat al-Hiyal (A Compendium on the Theory and Practice of Mechanical Arts) is an unsurpassed work on Arab mechanical engineering and the climax of ideas on medieval machines and their construction – giving a true insight to Arab mechanical technology. D.R. Hill writes that it is impossible to over-emphasize the importance of al-Jazari’s work in the history of engineering. He goes on to say that until modern times there is no document or book that provides a comparable wealth of instructions for the design, manufacture and assembly of machines as that of al-Jazari. Al-Jazari’s book, full of startling surprises, is a link in a long chain of achievements by Arab engineers and their ancestors in pre-Islamic civilizations. Al-Jazari assimilated the traditions of his predecessors then added, to what already had been invented, a number of artfully complex mechanical and hydraulic devices. His own inventions and improvements, which he made during his lifetime and described in detail in his book, included a variety of machines such as: intricate candle and water clocks, trick vessels, delightful fountains, amusing automata, mechanical flutes and water-raising devices. He described five different machines designed for raising water. One of these, very important in the development of the steam engine and pumping machinery, had a reciprocating pump with two cylinders and was designed to raise water up to 33 feet. An excellent source of Arab technology, his work had a great impact on the later development of steam and internal combustion engines, paving the way for contemporary automatic mechanical engineering. Unlike Leonardo da Vinci to whom he is often compared, he did not describe any war machinery. Rather, he created devices for the benefit of society or to entertain the wealthy. The last of the three books mentioned by Dr. al-Hassan was written in the 16th century by Taqi al-Din ibn Maruf al-Rashid al-Dimashqi. Called Al-Turuq al-Saniya fi al-Alat al-Ruhaniya (The Sublime Methods for Spiritual Machines), it describes most automata and other machines mentioned by his predecessors, emphasizing clock and watch-making, water-lifting machines and fountains. A mechanical engineer, mathematician, astronomer and scholar in physics, al-Dimashqi was among the first to explain steam power. His descriptions of mechanical devices were simple, clear and easy to follow. Of great importance was his blueprint for the first time of a six piston pump, and the use of can-shafts and cylinder blocks. A great contribution to mechanics, this pump is the direct ancestor to our present day motors. The Banu Musa, al-Jazari and Taqi al-Din are but a modest representation of the many hundreds of Arab scientists who wrote about mechanics and the related sciences in the Islamic world. Ibn Biruni, al-Farabi, al-Farghani, al-Khwarizmi, ibn Masawayh, al-Muradi, al-Razi, Ridwan bin as-Saati, ibn al-Samh, ibn Sina, and Thabit ibn Qurra are only a small number of the other distinguished Arab/Islamic inventors whose works in the field of mechanics have come down to this our modern age. All these historic technologists not only wrote about their inventions, but designed and built their own machines. They were master craftsmen combining theory and practice. It is apparent from their writings that they were familiar with the finished product. Arab mechanical technology was, in the main, based on water and air pressure. In the medieval world, the mathematics underlying the physical phenomena was not known. Hence, practical experience was the only way engineers could perfect what they were constructing. The efficiency of the final product was the result of trial and error. According to Dr. Hill, many of the methods used to obtain the necessary standards of accuracy were transmitted from the Arabs into developing European technology. Among the examples he gives are the grinding of plugs of valves and taps to the required tolerance; the different types of fits used in modern workshops; and the method of producing in large pulley wheels a perfect static balance. On the whole, Arab engineers excelled in the area of automata. They were true innovators in this field. It is said that the making of these ingenious devices, which included clepsydra and movements transmitted by chains and cords, was one of the factors which led man to develop modern science. Much of our technology in the field of delicate mechanisms, scientific instrumentation, and the intricacy of modern vending and calculating machines has evolved from these Arab/Islamic inventions. Arab automata were the ancestors of the elaborate European medieval water clocks. A fine example of the transfer of this technology to Europe was when King Frederick II of Sicily (1194 – 1250) summoned Arab engineers to construct clocks with improved mechanisms. Historians, describing these Arab built clepsydra, wrote that each one was more astonishing than the next. In the centuries of Arab/Islamic superiority in the field of mechanics, Spain and Sicily were the first lands in Europe to receive this technology. In the ensuing ages, they were to act as bridges between East and West. S. Cobb in Islamic Contributions to Civilization writes that Arab/Islamic science and technology reaching Europe through these countries awoke that continent from the Dark Ages in which it was slumbering. In the Iberian Peninsula, the Arab-introduced watering devices: the shaduf (weighted pole and bucket), sagiyah (chain of buckets) and noria, led to the expansion of irrigation and the supplying of water to urban centres. J. Read in The Moors in Spain and Portugal writes that the Arab methods of irrigation were far too perfect to be improved by the Spaniards or even destroyed and they remain today the basis for agriculture in the parched and drier regions of that country as well as in Portugal. Without the wealth created by these watered lands, the glorious civilization of Moorish Spain would not have been possible. La Mezquita in Cordova, the Alhambra in Granada, and the Giralda and Alcazar in Seville, which still evoke admiration, are a testimony to what Arab engineering in mechanics and construction bequeathed to the West. In those bygone days of Arab/Muslim splendour, when Europe was stagnating in darkness and its Roman built bridges and roads had decayed, Arab engineers in Moorish Spain constructed new bridges and improved the ancient roads to facilitate travel and commerce. Muslim Spain from the 8th to the 13th centuries was what America is in the 21st century. During these years of Arab/Islamic technical supremacy, Arab schools in the Muslim parts of Europe were the centres of diffusing knowledge to the remainder of the continent. Occupying the place of honour in the spread of Arab/Islamic sciences to Christian Europe was Toledo. From here, after its conquest by the Christians, a school of translators transferred most of the Arab learning to the West. It is believed that the inventions of Leonardo da Vinci owe their origin to the translations from Arabic of scientific books made in this city. Among others, during the 12th century, Domingo Gundisalvo translated the Statistics of the Sciences by al-Farabi which included the sciences of weights and engines. In the 13th century under the direction of Alfonso X of Castile, Libros del Saber, a collection of translations and paraphrases of Arabic works, were compiled. Both these translations of Arabic books, which dealt with lifting apparatus, astronomy and clocks were of great importance in the evolution of European mechanics. Historians have stated that there is hardly a single aspect in basic mechanical engineering that was not discovered by the Muslims long before Europe was aware of its existence. Dr. al-Hassan sums this up when he writes in his edited version of Kitab al-Hiyal that the Arabs in their collective impact, offered the West a relatively advanced mechanical technology. Additionally, as the European Renaissance came into being, followed by the Scientific Revolution, and ultimately by the Industrial Revolution, the Western world steadily helped itself to the findings and developments of the Arab/Islamic civilization which had been flourishing for seven centuries, extending until the 16th century. Justifiably, according to both Cobb and al-Hassan, there are few major technological innovations in the medieval centuries that do not show some traces of Islamic culture. Amal al-Nafi fi Sina at al-Hiyal (A Compendium on the Theory and Practice of the Mechanical Arts). A.Y. al-Hassan (ed.). Aleppo: University of Aleppo, 1979. Banu Musa. Kitab al-Hiyal (The Book of Ingenious Devices). (ed.) A.Y. al-Hassan (ed.). Aleppo: University of Aleppo, l98l. Chejne, A. G. Muslim Spain – its History and Culture. Minneapolis: The University of Minnesota Press, 1974. Hill, D.R. “Mechanical Technology”. The Genius of Arab Civilization. (ed.) Hayes, J.R. Cambridge, Massachusetts: The MIT Press, l983. pp. 203-215. Imamuddin, S .M. Muslim Spain 711 – 1492. Leiden: E.J. Brill, l98l. Landau, R. The Arab Heritage of Western Civilization. New York: The League of Arab States, 1975. Schacht, J., and Bosworth, C .E. (eds.). The Legacy of Islam. Oxford: Oxford University Press, 1979. Tyrrel, H. G. History of Bridge Engineering. Chicago: The G.B. Williams Co. Printers, 1911.